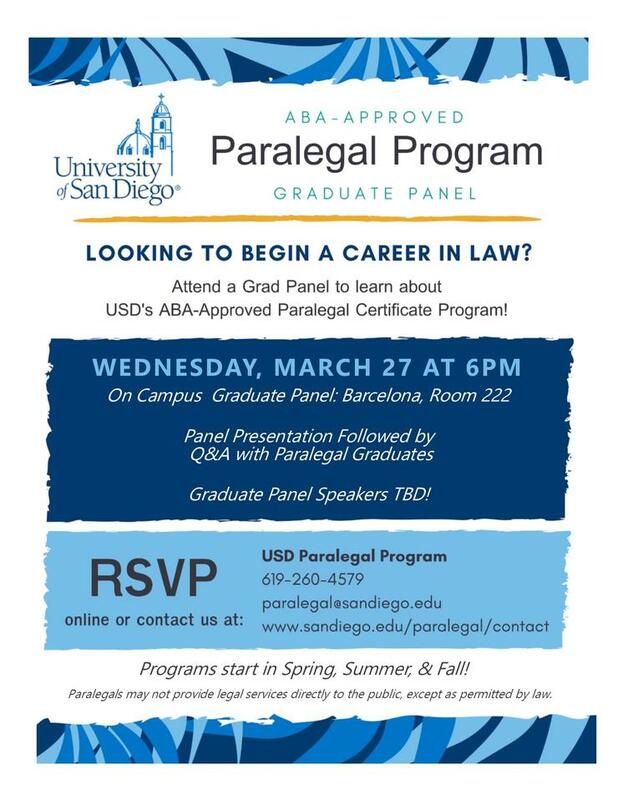 USD Paralegal Program Graduate Panel – Free! Wednesday, March 27, 2019 from 6:00 p.m. to 7:00 p.m. Graduates of USD's ABA-Approved Paralegal Program go on to a dynamic and exciting profession demonstrating relevant skills and becoming valuable members of legal teams in law firms, banks, corporations, government agencies, and more. If you are thinking about starting a paralegal career, attending the Graduate Panel will provide you with insight about the field and the preparation you'll need to begin. Learn about current trends and employment opportunities from recent graduates working in diverse areas of law. Get an inside look at job search techniques and what you can expect as a student and graduate of USD's Paralegal Program.